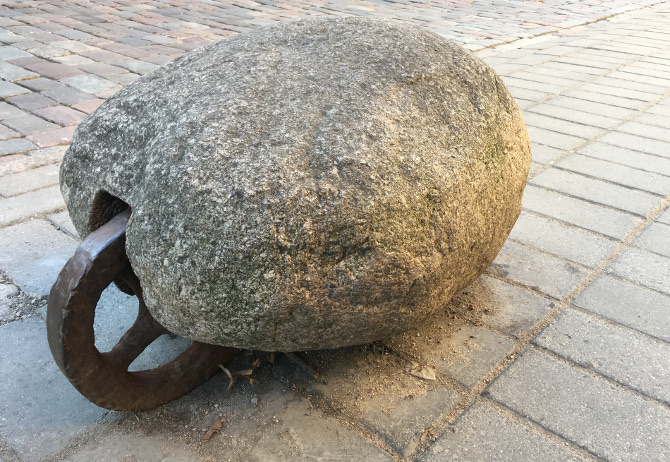 I met this wheeled rock in Kaunas, Lithuania. I’m sure there’s a perfectly sensible reason why a rock should be fitted with a wheel, but what could that reason be? What springs to my mind is Terry Pratchett’s sentient suitcase with feet, The Luggage. Could this rock be in the midst of some mind-boggling mission? Might it not be a rock at all? What unseen powers might it possess? How could the wheel aspect contribute to your plot line? Well, of course, that makes perfect sense! 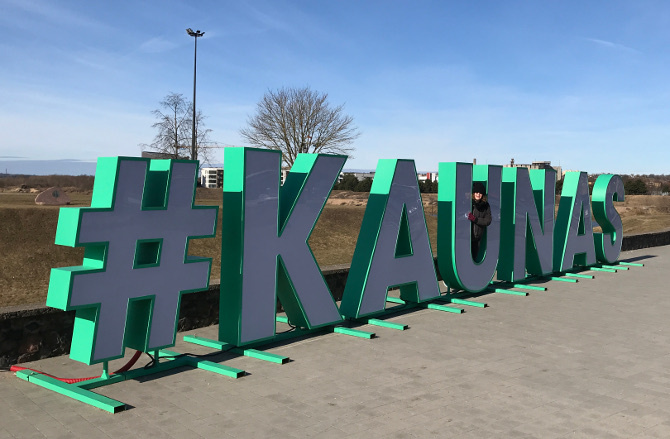 Our first full day in Kaunas, Lithuania, was flooded with bright sunshine and brilliant blue skies, so we took the chance to follow one of their excellent tourist maps, Wallographer’s Notes. Street art began to emerge in the city as a form of protest during the years of Soviet Occupation from 1944 to 1990. Today, the City Municipality regular invites applications of ideas for new artworks, and so every month new creations appear. Here are ten of my favourites. 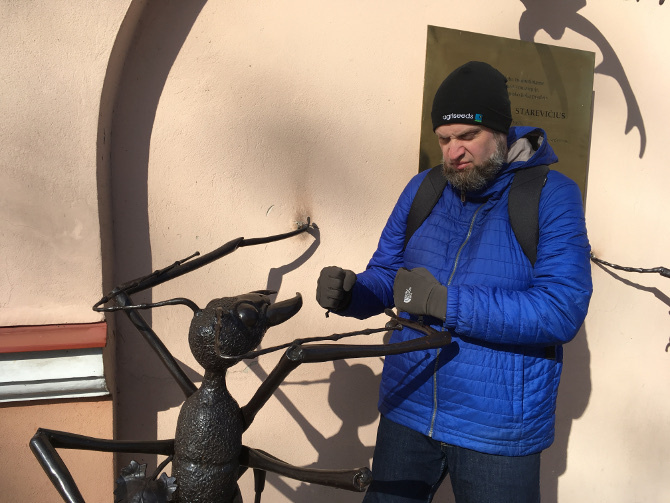 If you begin at the town hall, you will soon happen across this trio of gigantic insects: an ant, grasshopper complete with violin and stag-beetle created in honour of pioneering puppet animator Ladislas Starevich. 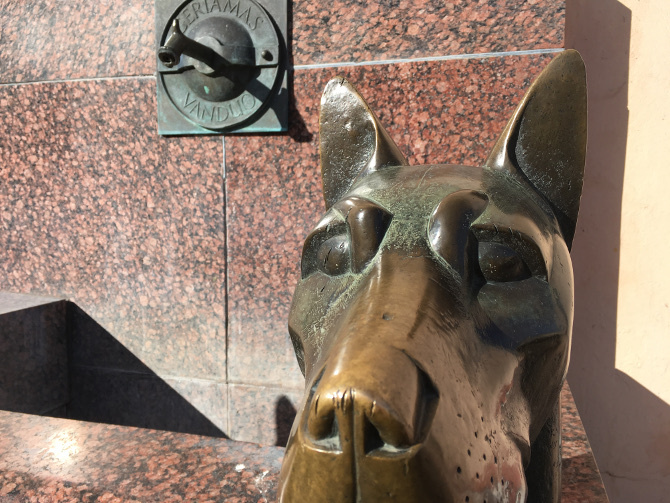 Created by sculptor Vytautas Narutis in memory of the canine guardians said to protect the sleep of emperor Napoleon when he stayed in Kaunas Old Town, Fontanas Šunys (Dogs’ Fountain) was installed in the Kaunas Town Hall square in 1987. The dogs have lovely friendly faces rubbed shiny in places, presumably from people patting their noses for luck. 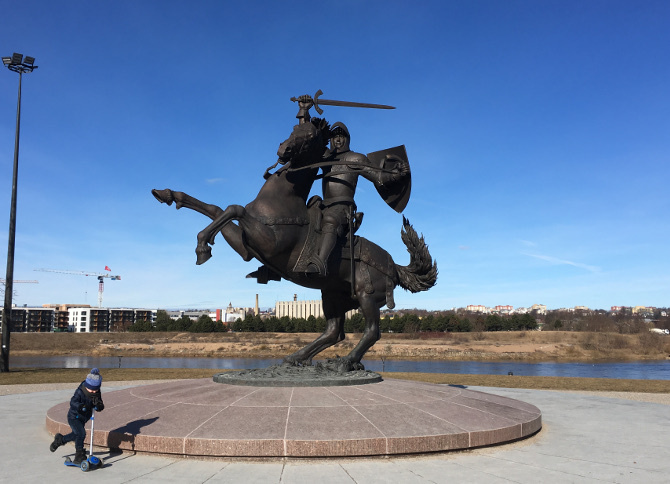 Located between the 14th century Kaunas castle and the Neris River, this exuberant statue is named the Freedom Warrior. The figure of the armour-clad knight on horseback mirrors the one of the city’s heraldic shield, known as Vytis. It stands an imposing seven metres high. I love its celebratory air, but feel its triumphant air is rivalled by the tot scooting around the monument’s base in my shot. Turn to the right with your back to the castle, and you’ll spy The Wise Old Man, or The Master, a gigantic portrait smoking a pipe apparently in his pyjamas. We visited on a Saturday when the square below was laid out with stalls selling freshly unearthed root vegetables, cheese, honey, cured fish and the eponymous tree cakes. The 440 m2 creation by artists Tadas Šimkus and Žygimantas Amelynas overlooks it all with a benevolent air. 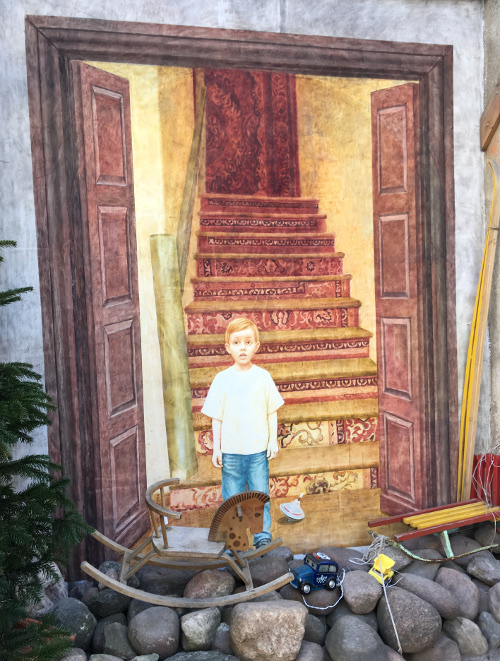 Ironically, he’s painted on the side of a former footwear factory, and though you can’t see his feet in this photo, he has no shoes. He’s said to be an homage to George Maciunas, one of the pioneers of the Fluxus art movement. This jaunty chap stands on a chair inthe courtyard of the Ars et Mundus Gallery. 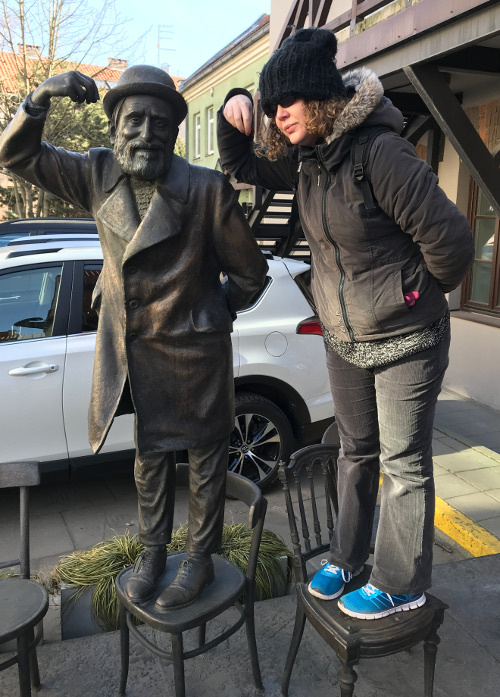 He is the sculpture of a beloved Kaunas-born author,Abraham Mapu, who is credited with writing and self-publishing one of the first Hebrew novels in 1853. I love the cheeky character sculptor Martynas Gaubas has achieved. With his hand held just so, he looks about to doff his cap in greeting. These concrete and sand owls mark the perimeter of Pelėdų Kalnas, or Owl Hill, and were created by sculptor Vincas Grybas in 1922. 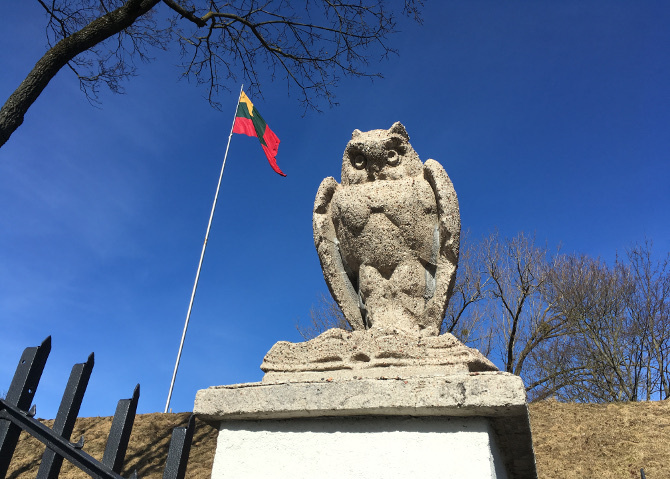 The owls are the symbols of Kaunas Art School, the hill and the city below. 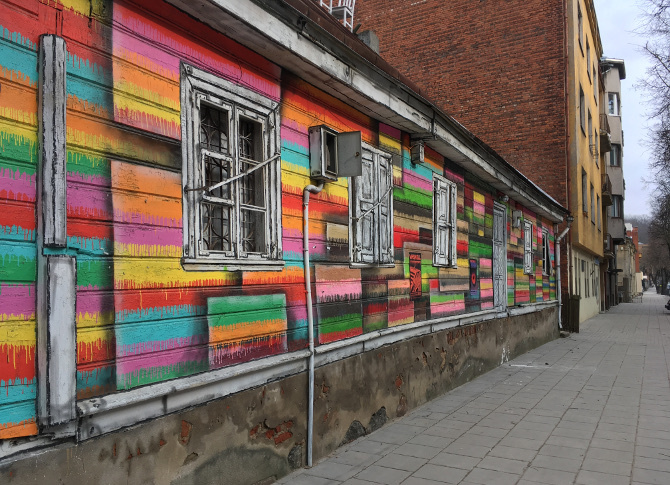 This gorgeous rainbow building springs out of its surroundings as a reminder that art rests on every corner of Kaunas. 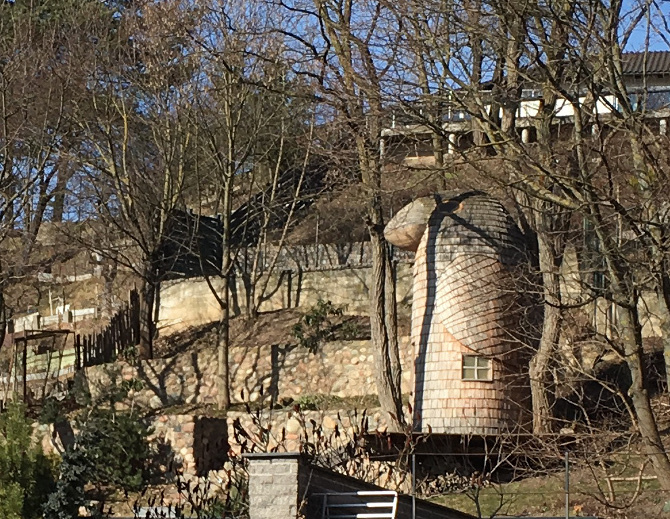 Once an abandoned and weather-beaten house, it’s now a vivid slice of life set almost midway between the Devil’s Museum and the Žaliakalnis Funicular (which was closed when we visited, with no explanation as to why). There are two chairs on the cabin’s roof, perhaps in case the devil or his wife fancy a rest. 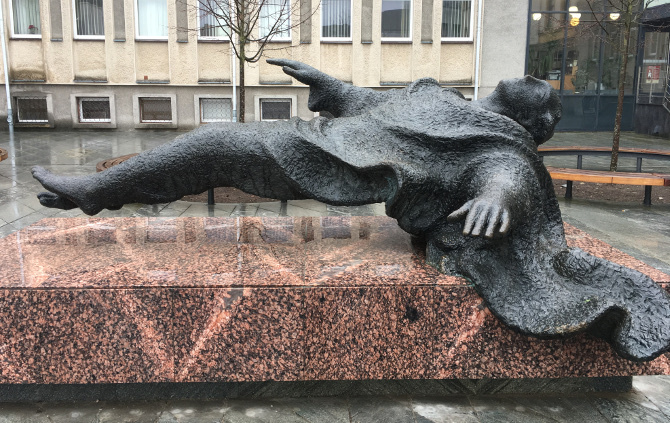 Situated close to St. Michael the Archangel’s Church, this sculpture resembles a miracle caught in mid-moment, as a figure rises, harnessed to its long-locked plinth only by a swathe of cloak. I’ve since seen photos of children pressing themselves beneath the hovering body, but when we saw it rain poured down and all that caught there was the suggestion of clouds. By the way, apparently the Lithuanian word of Levitator is levitatacija. Beautiful. 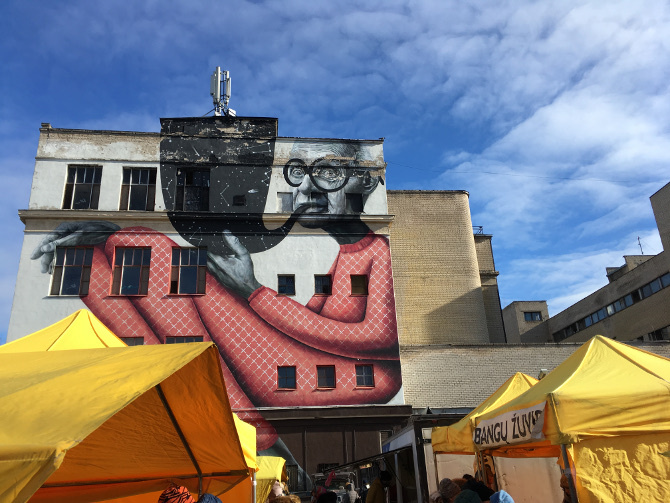 Begun in artist Vytenis Jakas more than a decade ago, the Yard Gallery is a constantly evolving creation, with new artworks being added by a range of artists, neighbours and passersby all the time. It aims to bring life and a sense of community to this space surrounded by residential homes. An astonishing space crammed with evidence of narrative and imagination. 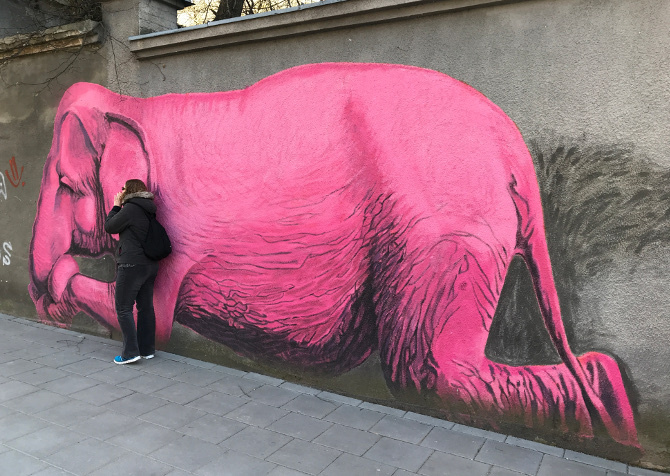 Just up the hill from the Yard Gallery, you’ll find a vast, resting elephant depicted in power pink. That large ear seems ripe for secrets, better than any church confessional. It’s by artist Vytenis Jakas(yep, him of the Yard Gallery, and to me seems to represent all things joyful and accepting in this quirky creative city. It was actually inspired by a graffiti slogan that translates as Love Conquers All. The accordion is a devil’s instrument. No, seriously. 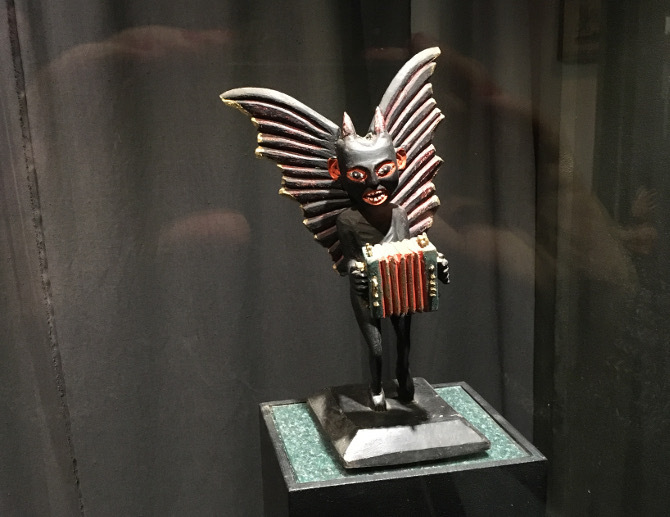 When visiting Kaunas, Lithuania, recently, I spent some time meandering the three storeys of the Devils’ Museum (highly recommended, btw), and saw numerous statues of gurning devils clutching elaborate squeeze-boxes. Somehow, it was no surprise. Unless played with uncommon skill, these tricky instruments sound somewhat like outraged felines. Far from accord, all you get is discord. What instrument or implement could you give the villain of a story to provide an insight into their depths of depravity? Go brash, or go subtle – you could set the whole tone of your piece. Have you ever taken a journey on a piece of art? 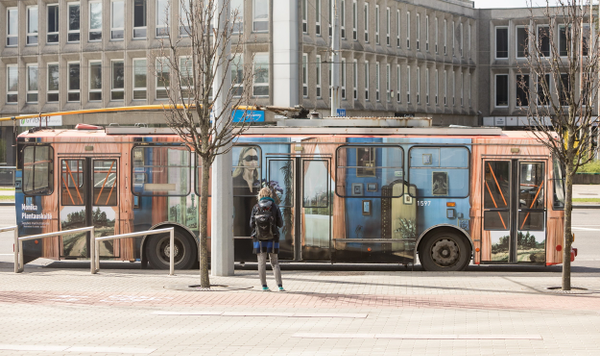 Now you can take an epic ride on one of Vilnius’ trolleybuses covered in contemporary art. 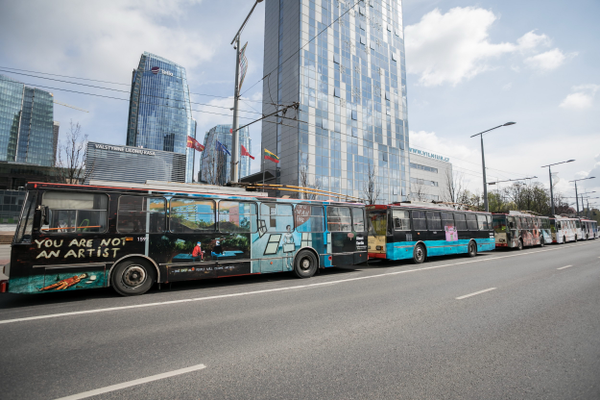 Running for the second consecutive year, the Painting Routers art initiative has transformed five trolleybuses into Vilnius, Lithuania, into canvases painted on by five teams of well-known young artists from Lithuania and Estonia. Artists involved in the project for 2018 include Goda Lukaitė, Donata Minderytė, Monika Plentauskaitė, Alexei Gordin, Kazimieras Brazdžiūnas, Vita Opolskytė, Kristina Ališauskaitė, Rosanda Sorakaitė, Kristi Kongi, and Rosanda Sorakaitė. The trolleybuses will be riding the streets of Vilnius until October 2018, offering plenty of time to spot all five works and ride each one as the mood takes you! More information about the project and about tourism in Vilnius visit www.vilnius-tourism.lt/en.